Autumn is the time for joining ewes plus maintaining the farm and the animals in preparation for winter. It’s a time for enjoying the quieter routines of the farm and the beautiful days that Autumn in western Victoria brings. 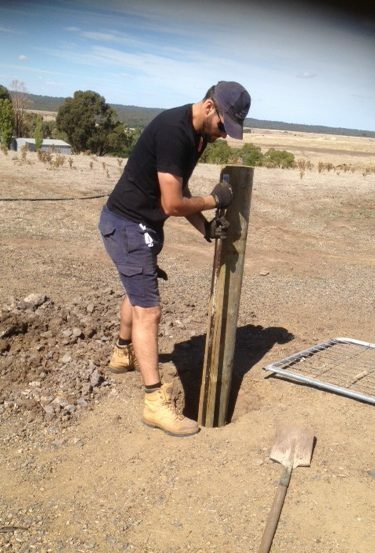 A time for mending fences, fixing equipment, preparing the soil for new pasture growth after a dry Summer, and ensuring ewes are in peak condition to allow them the best chance of becoming pregnant. Often the weather is just perfect at this time of year, and there is nothing better than being out in the paddock with a gentle sun shining or at the close of day with the light changing over the hills in the distance and the shadows lengthening. 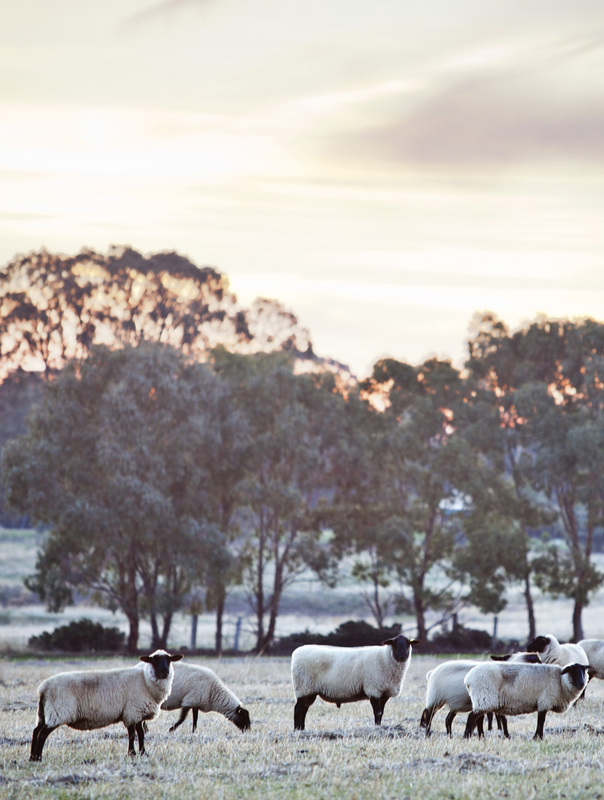 Suffolks, being a British heritage breed, are very seasonal in their fertility and ability to become pregnant, so the seasons are even more significant than might be the case with crossbreds, Merinos or Dorpers. As the days change from Summer to Autumn and daylight starts to shorten, Suffolk ewes’ metabolism changes and they come into oestrous ready for mating. So although it is possible to join ewes at other times of the year, success rate is far lower at those times and it is better to join around March to May. Likewise, although Suffolk rams can be horny any time of year, it is Autumn when the days grow shorter and the ewes are keen that the rams perform the best. One ram to 50 ewes is recommended but Galahad has 90 to service, so here at Glen Greenock Farm Galahad is given a few weeks me-time with the girls allowing time for our best ram to carry on the family genes before Lance (our other ram) gives him a hand. What a life! No downside to life for the boys. 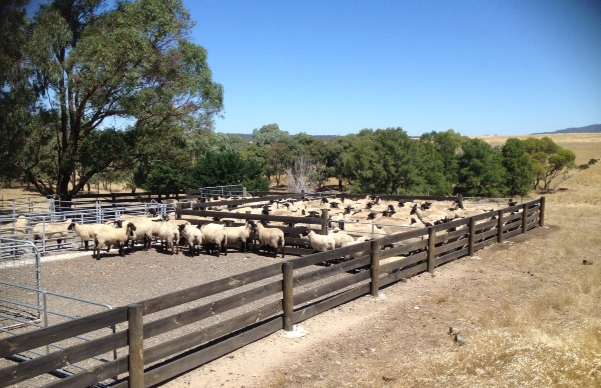 This year as with last year we have been experimenting with crossing our Suffolk ram over ten black Dorper ewes. 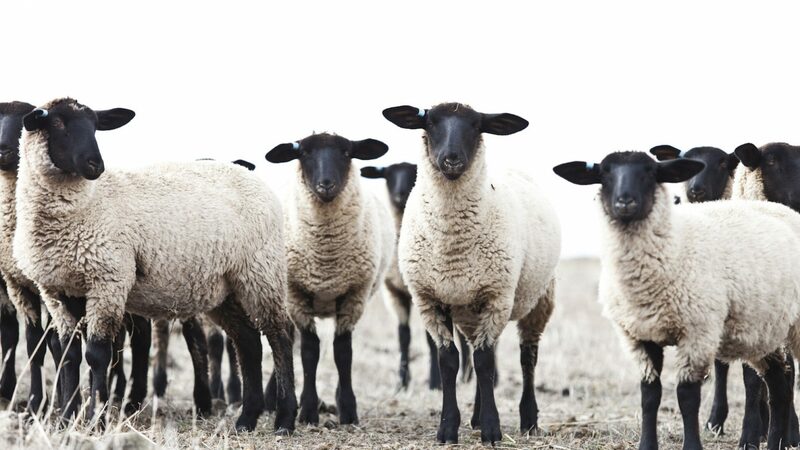 The Dorper is a breed that was created in South Africa by crossing hardy Persian sheep with good meat and robust Dorsett Horn rams and the Dorper is popular amongst hobby-farmers because of its ability to shed its fleece and hence not require shearing. However it is for other qualities of the Dorper that we are experimenting. The Dorper is especially able to thrive on poor or average pasture and does well on any poor grass due to its rough desert Persian heritage. We have seen this with our own small mob. In addition, the Dorper has the special quality of being able to be joined throughout the year and is not at all seasonal like the Suffolk. This could be useful to allow an extra lambing mid year. However we still believe the Suffolk has superior eating qualities and has especially good conformation (shape and size) so we are interested in what a cross will produce. Maybe the start of a new Australian breed: the Dorfolk? 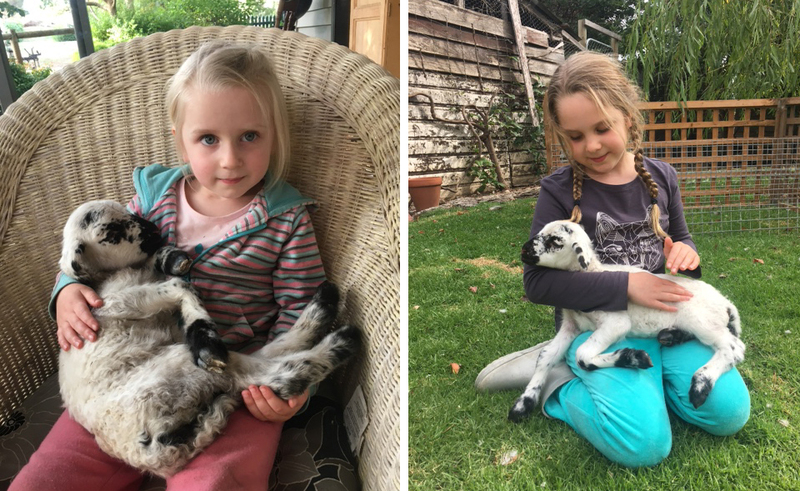 So Autumn is the time for our Dorpers to drop lambs and these have been coming thick and fast since the start of Easter! Beautiful to see and a chance to enjoy a handful of lambs rather than the hectic time over September when over 100 are dropped over a 4 week period! Previous years Autumn has been the time for paddock preparation for sowing new pasture or even cereal crop to ensure we have quality supplementary hay and fodder for the next year. However this year we have decided to minimise inputs and use more natural growth of pastures to save on costs but also move more to natural/biological pasture management. Earlier years of application of lime, compost, manures, microbes and fungi continue to contribute to our soil and pasture and save us money. Or at least that is the belief! So no ploughing and no seeding this year. Just application of natural products mostly via boomspraying including microbial preparations, soluble worm tea, molasses, and fungae. And if I can afford it: lime for the ever-present acidity and release of locked up minerals. The paddocks that have remaining dry pasture or stubble will NOT be burnt. Burning off wastes valuable fertility and carbon in a blanket of smoke. Rather paddocks are being treated with microbial stubble digester, slashed and windrowed so this can be eaten by stock (they love molasses in the digester!) and allow new pasture growth where the stubble has been removed by raking. The windrows will eventually rot down and become valuable compost/carbon matter. And what of maintenance tasks in Autumn at Glen Greenock Farm? Well as on all farms there are fences to mend, gates to re-hang and other tasks that we have been promising ourselves would do for the past five years! So we have been off to the main front paddock to run wire fencing mesh down a 200 metre stretch which has only been fenced with single wires since we moved here 17 years ago. This year the Suffolks have had the extra incentive of pushing through the fence to get at hay that is stored in round bales on the other side, so now is the time to fix that problem. Also a time to put in better gates and gateposts to allow better movement of sheep around the property. Over Easter we have enjoyed the company of Marcia’s son and family and it is a real joy to see the grandkids cuddling and spoiling the poddy lamb, visiting the donkeys, collecting the eggs, feeding the geese and chooks and just experiencing the great times of being together on the farm. However it is also an opportunity to exploit the free and willing labour and so it is off to the very back of the property where a humungous poplar tree has been blown down and destroyed a section of fence; and wouldnt you guess? Young ewes have found the hole and have been constantly visiting the neighbour’s property for a taste of their grass. So it has taken three men plus helpers to chainsaw the huge trunk and branches and then pull the tree away from the fence using the tractor and chains. Success! Nice job guys! Home for a beer. Meanwhile Glen Greenock Farm routine goes on. Our boy lambs from last year are now eight months old and growing steadily. Rainfall in our part of the world is sparse and pastures are modest: not lush and green like closer to the coast or over in Gippsland. So each four weeks we take lamb orders from customers posted on the web site, muster the boys, weigh them, select those that meet specification and load these into our stock trailer for the trip to the processors. All this including unloading is carried out by us as quietly and gently as possible and we ensure it is calm and stress-free for the lambs. Ten days later customers receive their wonderful vacuum-packed lamb cuts in boxes via our Glen Greenock Farm chiller delivered to their door. I will describe this process in another series of blogs which I hope will help you understand our processes, approach and ethical animal management from order to delivery. 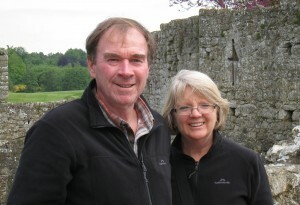 Ross and Marcia of Glen Greenock Farm focuses on producing naturally raised, ethically farmed lamb and selling their meat directly to customers.